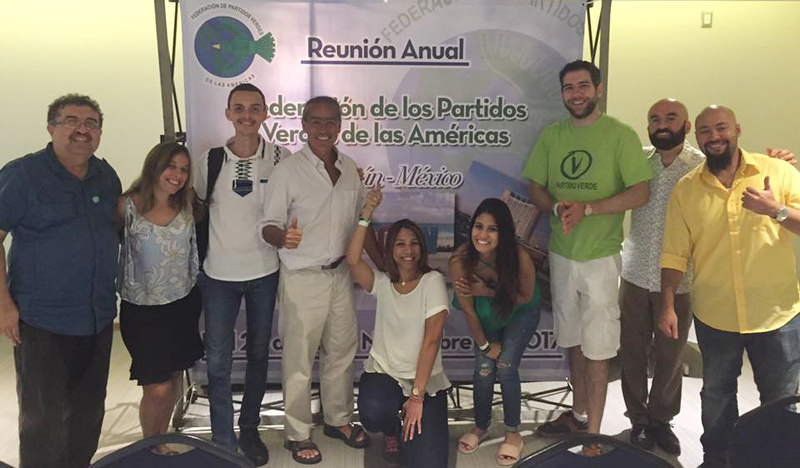 The Federacion de Partidos Verdes de las Americas (FPVA) held its annual meeting November 26-29 in in Cancun, Quintana Roo, Mexico, with Greens from eleven countries in attendance — Argentina, Brazil, Canada, Chile, Colombia, Dominican Republic, Guatemala, Mexico, Peru, Venezuela and the United States. The Green Party of the US was represented by three delegates, picture here from left to right Bahram Zandi (far left), Mike Feinstein (four from left) and Ahmed Al-Touny (far right). They are pictured here with members of the Young Greens of the Americas, that also met in Cancun over the same dates. Also pictured is Maria Isabel Moreno Salazar (fourth from right), who at 23 years old is the youngest member of Colombia’s national legislature. In addition to general business meetings of the FPVA, delegates and young Greens met with Green Mayors in Cancun and Puerto Morelos, and attended a debate among three candidates seeking to be elected next president of the Green Party of Mexico (Partido Verde Ecologista de Mexico). The FPVA has been meeting annual since 1998, working on international Green issues and promoting the growth of Green Parties throughout the hemisphere. Prior to the FPVA, Greens in Mexico, Canada and the U.S. formed CANAMEX in 1991, to bring Greens together from the three countries to work to oppose the North American Free Trade agreement being negotiated at that time. Eventually CANAMEX led to the founding of the FPVA.